One of the beautiful things about living in Southeast Asia is its treasure trove of ingredients. There are interlocking layers of ingredients based on whether one is urban or rural, which part of a given country, and then entirely unique palettes of flavors, combinations, histories and ingredients used from country to country. Being based in Thailand puts us in the center of a cross section of these cultures, tastes and ecosystems. 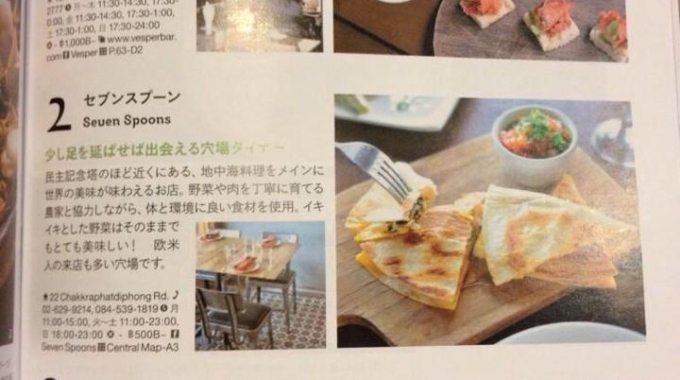 Seven Spoons will be highlighting unique and lesser known ingredients from Southeast Asia – particularly ingredients in remote and often indigenous farming areas, buried in memories of older generations and with a special focus on food products from forests that have long sustained people in the region. There are several reasons why we’re doing this. First, in order to add value to supply chains supporting local producers and biodiversity. This is one of the best ways to hold on to disappearing biological diversity. Second, culinary trends in urban environments can become narrow and limited quickly (‘McDonaldization’ or in Thailand, ‘somtamization’). This is a push back against this trend and an investment in a more diverse culinary repertoire. Finally, and most importantly, some of these lost, forgotten and neglected ingredients can be absolutely amazing. The first in our series features the Tree Basil or Clove Basil. Its Thai name, ‘Bai Yira’, can be a source of confusion as it seems to be associated with the ‘Cumin Leaf’ plant. This is likely compounded by ‘Yira’ being taken as a derivitive of the Hindic ‘Jeera’ or cumin seed. 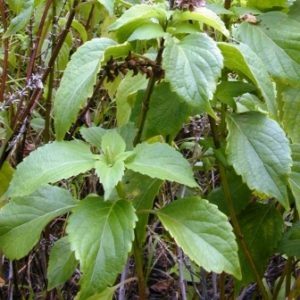 Bai Yira, however, is not related to Cuminum cyminum, but rather is Ocimum gratissimum, an herb found throughout the tropics and subtropics of Africa and Asia and referred to variously as ‘Tree Basil’ or ‘Clove Basil’. In Southeast Asia, Tree Basil is largely cultivated as a home garden crop but it is grown on a commercial scale in Vietnam. Tree Basil is processed and used in multiple forms, including for cooking where it is used in salads, soups, pastas, vinegars and jellies. In Thailand, it’s used as a flavoring in dishes such as soups and curries (‘Thom Bai Yila,” “Thom Kong,” etc.) and can be found in wet markets in Bangkok. Tree Basil is also used as a medicine in many parts of the world. Traditionally it is used as a general tonic and anti-diarrhea agent and for the treatment of conjunctivitis. The essential oils are used superficially for skin infections, and is taken internally for bronchitis. The dried leaves are in some places snuffed to alleviate headaches and fever among other uses. Scientific studies have validated the traditional uses, finding that O. gratissum has been shown to be active against some bacteria and fungal isolates, supporting the antibacterial and antifungal properties of O. gratissimum. Finally, the essential oils of the plant are used in perfumeries as well as locally as insect repellents. 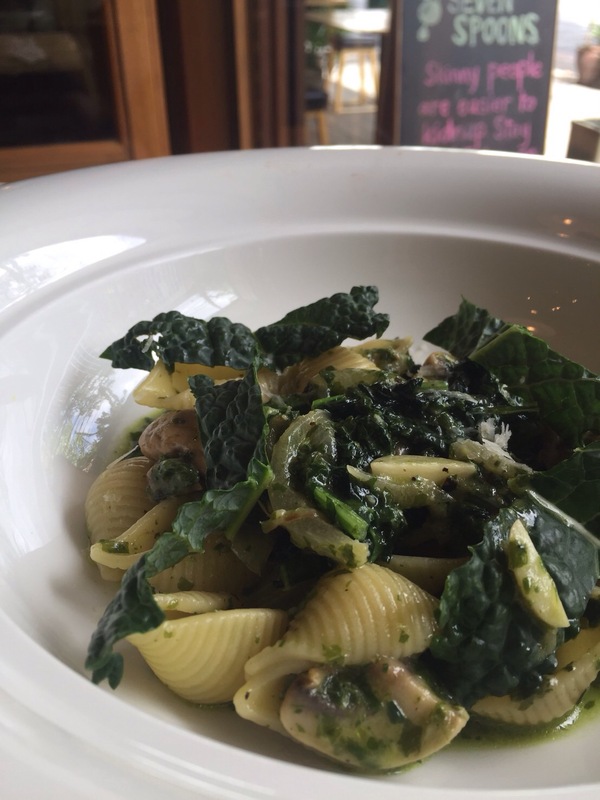 At Seven Spoons, we have looked for new ways to explore and present the unique flavors and properties of Tree Basil. Given its similarities with common basil, we have substituted it in a pesto and offered it on our lunch menu as, “Conchiglie with tree basil pesto, braised kale and smoky bacon.” While availability is somewhat seasonally dependent, we welcome you to come by and sample this herb, re-imagined as a complement to a familiar comfort food.